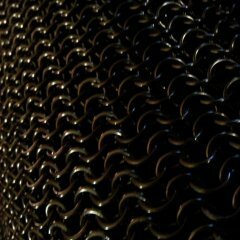 Back in March I had asked for pics of slashed maille for a cosmetic addition to my shirt. Today I realized that I didn't get back to you guys to show off the finished project. This is about as close as I'm going to get it seems. Now I need to fire up IGP and give it a whirl. I recently completed a chain shirt and have an idea for additional character. I would like to simulate battle damage then patch the holes with red AA rings. My google-fu has come up with bupkis in regards to pics of damaged maille.though. 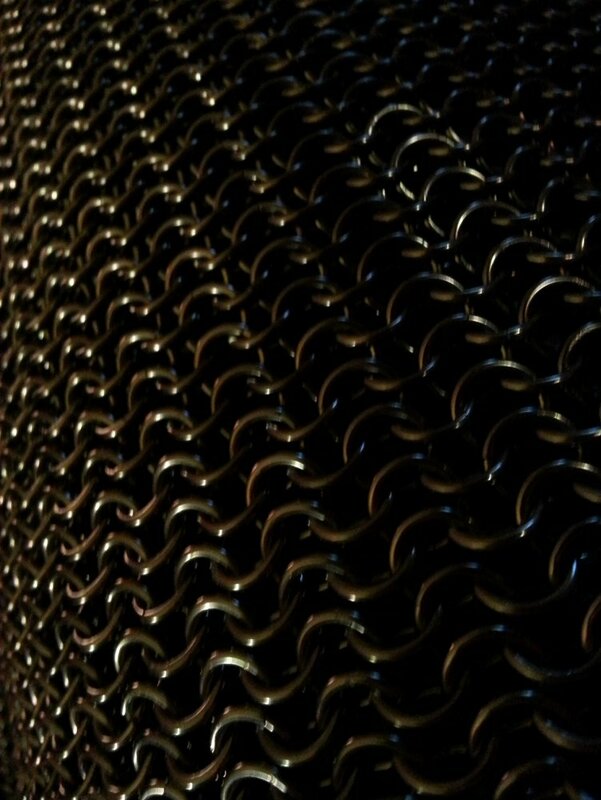 To be exact, what I'm looking for are pics of a couple slashes and possibly a penetrating stab wound of about 3in (8cm), Now I know that actual riveted maille was very resistant to such actions but I'm not going for a historic look, more of a cosmetic feature. I could build a frame and take a couple whacks at it but my swordplay has only been tested by frisbees and produce. Let's take a collection of stuffed animals with the eyes X-ed out and send them in. Welcome to the hobby. We have plenty of people lurking around to answer just about any question you might have, or at least willing to point out where it was answered before. You have a rather large project in the works it seems. You have chosen wisely in starting small and working your way up. Many people jump on the armor bandwagon and rarely finish what they start. Looking forward to seeing your work. It was just total luck that the player still worked after being soaked like that. I just like seeing the look on people's faces when I say that. Maille is waterproof. I know this for a fact. I once made a cover for my mp3 player. Washed and dried it through a full laundry cycle. The player still worked. I haven't forgotten about my findings. Just can't locate my cable for my camera. Alright, here's the setup. I have a two drum rotary tumbler. My wet drum has basic dish soap and water, the dry drum has brown rice. I put 40 rings in each, ten of each in gold, bronze, red, and green. I also have 40 set aside as a control group. I documented each batch before, and will do so after tumbling. tumbling time will be 12 hours. I know it's scientific method overkill. With some of the discussions I've had on the forum over tumblers and media I feel that I should document a complete process. Nah, the coating is fine. I tumble my AA all the time. I saw it a few years ago but someone said "It it can't handle tumbling it can't handle being worn"
The AA coating is durable, but not invulnerable. A plier slip on a black ring will almost always result in a shiny silver chunk visible. You can tumble it with shot but I really don't see the point. Corncob, rice, flour, and walnut will do the job just fine. It took me about a day and a half in a rotary tumbler with shot and water to damage the anodized coating with the old process rings. (I was trying to make gunmetal grey) Haven't tried it with the new.